Human Rights Activist News Agency (HRANA) On Wednesday, November 14, 2018, Baha’i Mashhad resident Dori Amri began serving her one-year prison sentence in Mashhad’s Vakilabad Prison. May Kholousi and her daughter Saghi Fadaei, Amri’s Baha’i co-defendants, turned themselves in October 31st to begin serving their own one-year sentences. The verdict in Amri, Kholousi, and Fadaei’s case was recently upheld in Khorasan Razavi Appeals Court. Human Rights Activists News Agency (HRANA) -Baha’i citizens of Iran have continued to face persecution this month, in the form of grave desecrations, business shutdowns, and interference by authorities in their places of employment. Meanwhile, one Baha’i prisoner has returned to prison after a furlough release. Four days after her October 24th burial, the body of Shamsi Aghdasi Azamian, a Baha’i resident of Gilavand village near the city of Damavand, was found in the nearby rural outskirts of Jaban. According to a close source, security forces called Azamian’s son that same day, informing him that her remains had been found and instructing him to rebury them in Tehran. Security forces had previously forbidden Baha’i Gilavand residents from burying their dead locally, ordering instead that all deceased Baha’is be interred in the capital city, 50 miles west by mountain pass. Though Azamian’s son initially refused — citing Baha’i religious custom to lay believers to rest no more than one hour away from their place of death — the family ultimately complied under pressure from security forces. Earlier this year, Iranian authorities issued a court order to lock down a Baha’i cemetery in the city of Kerman. Baha’is in Sanandaj, Ahvaz, Tabriz, and Sangesar have also been prevented from burying their loved ones in local cemeteries, and in the cases of Sangesar and Sanandaj, some Baha’i burial sites have been reported destroyed. As of yet, no one has claimed responsibility for the desecration of Azamian’s grave. Iranian Authorities have shut down the small businesses of five Baha’i Ahvaz residents and two Baha’i Abadan residents as of November 5th. The businesses — which had been temporarily closed, in observance of Baha’i religious holidays — were court-ordered to remain sealed off to the public. Their owners were identified as Ahvaz residents Vargha Derakhsan, Behrouz Zohdi, Jahanbakhsh Afsharzadeh, Feizollah Ghanavatian, Sohrab Derakhsan, and brothers Arman Azadi and Aram Azadi of Abadan. Having run their business for the past 38 years, the Azadi brothers had already experienced a forced shutdown on July 12, 2018. After a 14-day tug-of-war with security forces, the prosecutor’s office, and other municipal authorities, they managed to re-open their store on July 26th, only to be shut down again this month. Despite trade union regulations protecting business owners from arbitrary closures, Baha’i citizens regularly face unexplained restrictions on their commercial activity. And while Iranian businesses are legally permitted to close up shop for a maximum of 15 days per year — for any reason — some have been forced to stay closed after briefly pausing their operations for Baha’i holidays. On December 3, 2017, Rouhani aide Shahindokht Molaverdi said that Iranian authorities were looking into a legislative solution to this issue. HRANA reported on the forced closure of 11 Baha’i-owned business in Ahvaz in July of this year, and previously published a story on the same trend in Abadan. Afshin Seyed Ahmad, a Baha’i political prisoner serving a three-year sentence for “acting against national security” and “propaganda against the regime,” returned to prison on November 11th after eight days of furlough. This was Ahmad’s first furlough release since beginning his sentence June 28, 2016, in Evin Prison. He has since been transferred to Rajai Shahr. Ahmad previously spent 20 days in solitary confinement after a November 2012 arrest. Two educational institutions in the city of Shiraz have been shut down by court order for employing recently-arrested Baha’i citizens Nora Pourmoradian and Elaheh Samizadeh. HRANA reported on Pourmoradian and Samizadeh’s release on October 10th after spending more than three weeks in custody. The two were working in the field of music education for children. A close source backed speculation that the institution’s shutdown was prompted by Pourmoradian and Samizadeh’s employment there. Baha’i citizens of Iran are systematically deprived of religious freedoms, while according to Article 18 of the Universal Declaration of Human Rights and Article 18 of the International Covenant on Civil and Political Rights, all people are entitled to freedom of religion, belief, and changes thereof, as well as the right to express and practice those beliefs as individuals or collectives, in public or in private. Though unofficial sources estimate the Baha’i population of Iran at more than 300,000, Iran’s Constitution officially recognizes only Islam, Christianity, Judaism, and Zoroastrianism, and does not acknowledge the Baha’i faith as an official religion. As a result, the rights of Baha’is in Iran are systematically violated. Human Rights Activist News Agency (HRANA) – Baha’i citizen Bahareh Ghaderi, who was arrested September 15th, was released Saturday, November 3rd on a bail of 200 million tomans [approximately $13,500 USD] pending completion of her investigation. 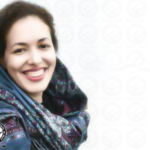 On October 18th, Niloufar Hakimi and Ehsan Mahboob Rahvafa also went free on bail. Their fellow Baha’is Nora Pourmoradian, Soudabeh Haghighat, and Elaheh Samizadeh were released October 10th. Two Baha’i prisoners remain in the custody of Shiraz Intelligence Ministry detention center No. 100. Shiraz, the capital of Fars province located 425 miles south of Tehran, is the birthplace of Ba’b, who formulated the Baha’i religion there in the 19th century. It is home to one of the largest Baha’i communities in Iran. Based on unofficial sources, more than 300,000 Baha’is live in Iran. Iran’s constitution, however, recognizes only Islam, Christianity, Judaism, and Zoroastrianism, and does not acknowledge the Baha’i faith as an official religion. Consequently, the rights of Baha’is are systematically violated in Iran. Human Rights Activists News Agency (HRANA) – At 5 p.m. on October 31st, a Baha’i mother and daughter turned themselves in to begin serving one-year prison sentences. Mashhad resident May Kholousi, her daughter Saghi Fadaei, and their fellow Baha’is Shayan Tafazzoli and Dori Amri were all sentenced February 2018 by Judge Soltani of Mashhad Revolutionary Court Branch 3 on charges of propaganda against the regime. Appeals court upheld their sentences on August 26, 2018. Security forces arrested all four in Mashhad in June 2014. 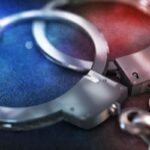 Two court sessions met for the defendants while they were free on bail, on December 17, 2014, and June 17, 2017. Human Rights Activists News Agency (HRANA) – Two Baha’i residents of Karaj, a northwestern suburb of Tehran, became the latest victims of the Iranian authorities’ crackdown on the Baha’i community when they were arrested October 16, 2018. Parvan Manavi and Elham Salmanzadeh became the seventh and eighth Baha’is to be arrested in their city after authorities confiscated some of their books and personal belongings during a raid of their homes. A close source told HRANA that security forces first searched the workplace of Manavi, a greenhouse operator, before escorting him to his home where they carried out a search and seizure. “They raided Elham Salmanzadeh’s home at the same time, and then arrested her afterward too,” the source added. On September 16th, HRANA reported on the arrest and transfer to Evin Prison of four Baha’i Karaj residents: Peyman Manavi, Maryam Ghaffaramanesh, Jamileh Pakrou, and Kianoush Salmanzadeh. 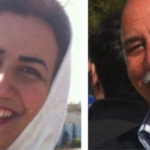 HRANA also reported on the arrest of two more Baha’i Karaj residents, Hooman Khoshnam and Payam Shabani, on September 24 and 25, 2018. In recent weeks, HRANA also reported on the arrest of a number of Baha’i citizens in Shiraz and Isfahan. Over the past month, members of Iran’s Baha’i religious minority have faced increased pressure across the country from Iran’s security and judiciary establishment. 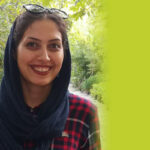 Human Rights Activist News Agency (HRANA) – The aggression against Baha’is in Iran was still palpable Thursday, September 27th when Shiraz-based Security forces raided the home of Shirazi Baha’i prisoner of conscience Noora Pourmoradian, seizing her personal belongings and temporarily detaining her mother and father. Claiming that the search was necessary to the completion of Noora’s case, security forces threatened the Pourmoradian family with “severe consequences” if they leaked photo evidence or publicly disclosed information about the incident. “To intimidate them, they handcuffed Mr. Saeid Pourmoradian (Noora’s father) and took him into the car, menacing him [about what would happen] if he didn’t keep quiet,” a close source told HRANA. On Sunday, September 16, 2018, HRANA reported on Noora Pourmoradian’s arrest and transfer to a Shiraz Intelligence Detention Center known as Plaque 100. Four other Shirazi Baha’is were arrested the same day: Elaheh Samizadeh, Ehsan Mahbub-Rahvafa, and married couple Navid Bazmandegan and Bahareh Ghaderi. In recent weeks, HRANA reported on the arrest of several Baha’i citizens by security forces in the cities of Shiraz and Karaj, so many instances of increasing pressures on this religious minority community from judicial and security institutions. In recent weeks, HRANA reported on the arrest of eight Baha’i residents of Baharestan, a newly-built city about 18 miles south of Isfahan: Saham Armin, Afshin Bolbolan, Anush Rayneh, Milad Davardan, Farhang Sahba, Bahareh Zeini (Sobhanian), Sepideh Rouhani and Fuzhan Rashidi. Meanwhile, six Baha’i residents of Karaj were arrested and transferred to Evin Prison: Hooman Khoshnam, Payam Shabani, Peyman Maanavi, Maryam Ghaffaramanesh, Jamileh Pakrou, and Kianoush Salmanzadeh. 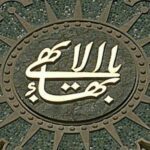 Based on unofficial sources, more than 300,000 Baha’is live in Iran. Iran’s Constitution, however, only recognizes Islam, Christianity, Judaism, and Zoroastrianism, and does not acknowledge the Baha’i faith as an official religion. Consequently, the rights of Baha’is are systematically violated in Iran. Human Rights Activists News Agency (HRANA) – Authorities associated with Iran’s intelligence ministry arrested five Baha’i citizens this weekend – September 15th and 16th – in the central Iranian city of Shiraz. The first three Baha’i citizens – Elaheh Samizadeh, and married couple Navid Bazmandegan and Bahareh Ghaderi – were arrested and taken to an undisclosed location on Saturday. On Sunday morning, Baha’i citizens Ehsan Mahboob Rahvafa and Noora Pourmoradian were arrested and taken to a detention center run by the city’s intelligence department. Bazmandegan was arrested at 6 p.m. while teaching a psychology class, a credible source told HRANA. According to the source, while Bazmandegan was being interrogated in different room, authorities filmed the students, taking their identification cards, computers, flash drives, mobile phones, and the passwords to their mobile devices. All those present were asked to sign a document they were prohibited from reading in its entirety, and told to clear the area within 10 minutes. Bazmandegan was subsequently escorted to his home, where authorities conducted a search and seized his personal belongings. His wife Bahare was also arrested and transferred to an undisclosed location. Last month, HRANA reported on the arrest of a number of Baha’i Shiraz residents who were taken to the same detention center. Baha’is are Iran’s largest non-Muslim minority and are systematically persecuted by the government.